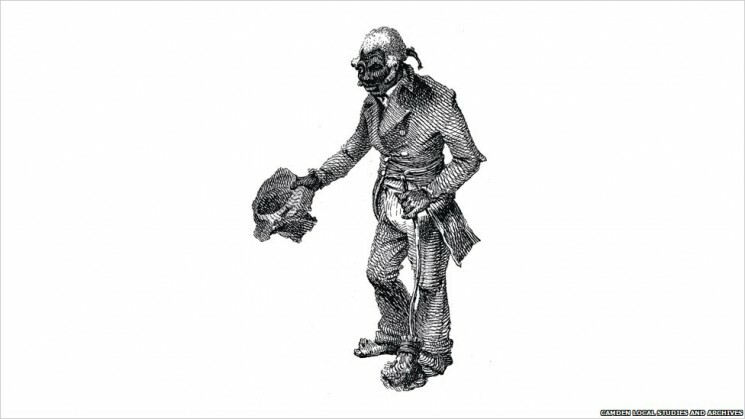 Gurkhas occupy an interesting place in British folklore. Universally recognised as ferociously loyal, heroic and determined fighters in the British army, they were only recently given right to settle in this country, and then only after a high-profile media campaign. In this guest blog, Krishna P Adhikari recounts what is known of one of the first Nepali visitors to Britain, Motilal Singh, who came to the country halfway through the 19th century. This year marks the bicentenary of the establishment of diplomatic relations between Nepal and Britain. Although the recruitment of the Nepalis (as Gurkhas) into the British Army started 200 years ago, restrictions on Gurkha migration to Britain were eased only a decade ago, in part the result of a memorable public intervention by Joanna Lumley. Nepalis are now a fast-growing minority group, estimated at around 100,000 people and spread across the UK, with a tendency to cluster around towns with strong links to the British Army, such as Aldershot and Folkestone. Many non-Gurkha Nepalis in the UK work as doctors, nurses, academics and entrepreneurs. Overall, Nepalis form a culturally diverse and economically active group. This turns out not to be the case, however. When I was studying and writing a book about Nepali migration in the UK (Nepalis in the United Kingdom: An Overview), I came across a substantial 18-page article called ‘Some Accounts of Nepaulese in London’ in the July 1850 edition of the New Monthly Magazine and Humorist. This article, written by a man called Motilal Singh (whose name was anglicised as Mutty Loll Sing), reveals that he reached Britain several years before Jang Bahadur arrived in London. Motilal Singh had previously been unknown to Nepali historians, and his article unveils important information about himself, his encounter with Jang Bahadur and life in the UK. 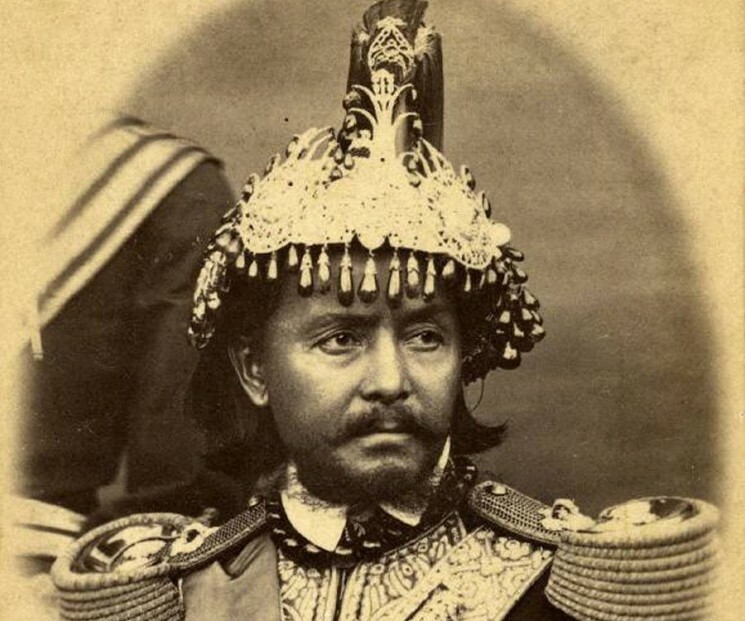 Junga Bahadur Rana (1817–77), the first Nepali prime minister to visit Great Britain – but not the first Nepali to do so. Motilal Singh was born in Bhaktapur in the Kathmandu valley, and was 19 when he fought in the Anglo-Nepali war. He was wounded, captured and imprisoned. Appreciating the bravery and valour of their opponents, the East India Company formed the first battalion of Gurkhas in 1815, which Motilal joined. There he learnt to speak English. Later, he married in Calcutta (Kolkata) and had several children. In a surprising turn of events, Motilal came across the members of the Nepali mission on 27 May 1850 and soon after was rescued from London’s St Paul’s Churchyard, where he had been living for years as a crossing sweeper. In Victorian times, the beggars in the street of London included those from poor families, children and also ‘Hindus, Lascars, or Orientals of some sort’. Several newspapers sensationalised the story: ‘Everyone who has passed through St Paul’s Churchyard to Cheapside on a rainy day, when birch brooms are very much in requisition, must have noticed the well-known Hindoo crossing sweeper … He now appears in the carriage of his Excellency every morning arrayed in a new and superb Hindoo costume … ’ Motilal was taken to Richmond Terrace in Westminster, where the Nepali Embassy was housed. He was a valuable member of the mission and visited many places as an informal interpreter. It is safe to say that meeting Jang Bahadur in London changed Motilal’s life altogether. Motilal mentions several events which give some idea about Victorian London. The London underground system, which came into operation much later, was already being built. The party crossed the Thames using a tunnel constructed by a ‘clever Frenchman’ (Marc Brunel, father of Isambard Kingdom Brunel). Motilal describes a steam train, in which the Nepali mission travelled from Southampton to London, as a ‘fire-driven monster’. 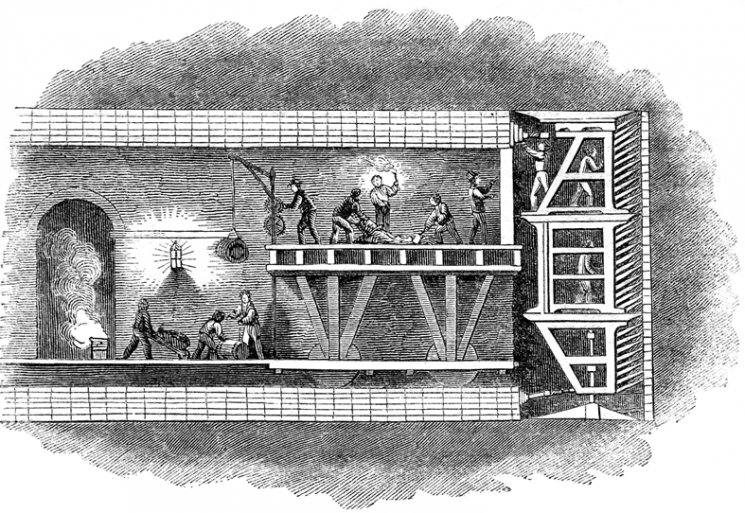 The tunnelling shield, invented by Marc Brunel, father of Isambard Kingdom Brunel. The shield was used to construct the first tunnel under the Thames at Rotherhithe, which is the tunnel that Motilal Singh visited as part of the Nepali mission. Marc Brunel, the ‘clever Frenchman’, was a refugee from France. They visited Epsom in a horse carriage to see the horse racing, which they were told was the ‘chief pleasure’ for English people – the Derby being ‘the greatest of all’ in England. Epsom racecourse in Surrey during Derby week. 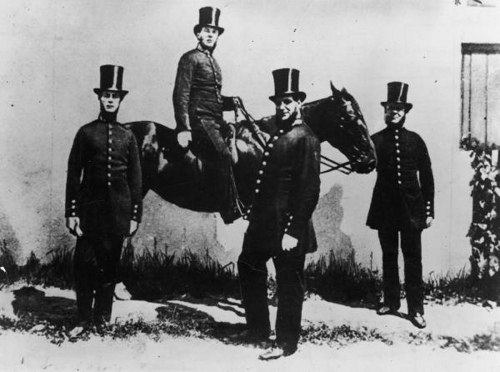 ‘A’ Division, Metropolitan Police, 1864. They also visited the world’s largest brewery of the time, operated by Barclay Perkins in Southwark. Nearby was the Phoenix Gas Works, where the city’s light was generated. Motilal describes passing through a ‘thickly populated town’ (which, because of the tanneries, was very smelly) and reports the water of the ‘pious’ Thames as being dirty and polluted. 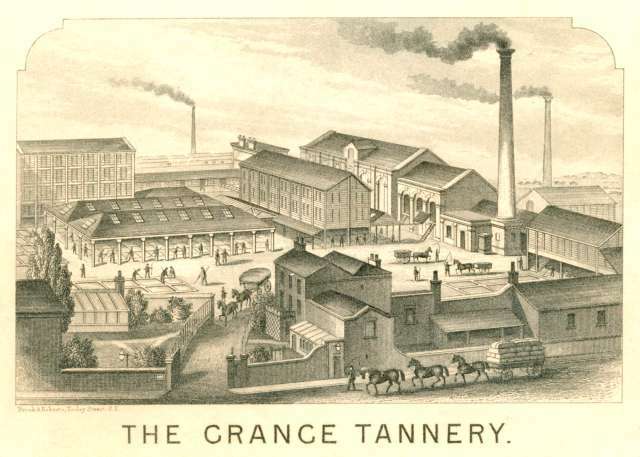 The Grange Tannery, Bermondsey, 1876. Tanning and food processing were the two main industrial activities in the area, both giving rise to some highly unpleasant smells. The Nepali team visited the St James Theatre (according to Motilal’s account, the British liked the plays but relied on French actors because they were ‘unable to act them’) and attended several grand parties, including one hosted by Benjamin Lumley (no relation to Joanna Lumley, who campaigned on behalf of the Gurkhas), who managed the theatre. Strict cultural differences meant that the Nepalis did not eat or drink anything in these gatherings, which their English hosts (including the Queen) must have found difficult to comprehend. The reason for this was that the Nepalis were teetotal, and their faith in ritual purity meant they refused meals cooked by people they deemed ‘polluted’. Racial epithets were common in Victorian society, and went both ways: the Nepalis were referred to as ‘the blacks’, and Motilal himself uses phrases such as ‘white as cauliflower’ and ‘red-faced’ to describe the English. Motilal accompanied Jang Bahadur’s party to Paris, and it is likely that his desire to return home was ultimately fulfilled. Although an ordinary man, Motilal is an important historical figure because of his travel from Nepal to India and then to Britain and later France, and also because he was the first Nepali known to have visited the UK, and to have published in English. Perhaps surprisingly to our current-day sensitivities, Motilal’s difficult circumstances in Victorian Britain were in no way helped by his being a Gurkha. Today the context is very different – Gurkhas are held in high esteem – and yet the lives of ex-Gurkhas in Britain are not without problems. Former Gurkhas continue to fight for equal pensions, family visas and other welfare entitlements, and continue to face occasional racial prejudice. A greater appreciation of the long history of Gurkhas living in the UK, going as far back to, and perhaps beyond, Motilal Singh, could help to address some of these issues. Dr Krishna P Adhikari is a research fellow at the Institute of Social and Cultural Anthropology, University of Oxford, and was previously executive director of the Centre for Nepal Studies UK (CNSUK). Among his publications are Nepalis in the United Kingdom: An Overview (2012) and The Mysterious Life of Motilal Singh: The First Nepali in Britain and His Historic Article (2013, in Nepali, with a 2nd edition due to be published in both Nepali and English). He is also a co-author of CNSUK’s British Gurkha Pension Policies and Ex-Gurkha Campaigns (2013). He did his PhD at the University of Reading (2007).